Frontiers Records announces the release of PRETTY MAIDS 13th studio album! Preceded by the digital only release of the single “Little Drops of Heaven”, “Pandemonium” is out on May 14th in Europe and June 8th in the USA. Danish Dynamite Rockers Pretty Maids will release their anticipated new album “Pandemonium” on May 14th in Europe and June 8th in the USA. “Pandemonium” is the band’s 12th studio album and their first full length release over the last four years. A 90 secs. preview of the single “Little Drops of Heaven” is now available for streaming on www.prettymaids.dk and on the band’s and Frontiers myspace sites (www.myspace.com/pmaids / www.myspace.com/frontiersrecords). 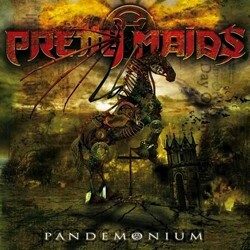 Produced by Jacob Hansen (who has also worked with Volbeat, Rob Rock and Beyond Twilight between others), “Pandemonium” with its melodic approach is a definite return to the “Future World / Red Hot and Heavy” era of the eighties, but with an updated sound and freshness that consolidates that Pretty Maids are as strong as ever. “I think this new record shows the band in its finest moment”, says singer Ronnie Atkins “that’s definitely our best effort in many years and the spirit in the band is higher than ever”. This album also introduces keyboard player Morten Sandager as a permanent member of the band and his impact is evident on the tracks of the cd, particularly on the hauntingly melodic new single “Little Drops of Heaven” which will be released — only as a digital download, as an exclusive teaser leading to the album’s release, on April 13th worldwide. Written in the fall 2009 and recorded in the winter 2010, “Pandemonium” will be supported by several festival appearances during the summer of 2010 and then followed by a full scale European tour in Oct/Nov 2010. Pandemonium, I.N.V.U., Little Drops of Heaven (MP3 sample), One World One Truth, Final Day of Innocence, Cielo Drive, It Comes at Night, Old Enough to Know, Beautiful Madness, Breathless, It Comes at Night (remix)*.